When it comes to gaming, the NVIDIA SHIELD Android TV is hands down the best among all streaming boxes. SHIELD Android TV gives you many ways to game. Whether you want to play fun console-class Android games such as The Talos Principle or the latest AAA PC games such as The Witcher 3: Wild Hunt streamed from our revolutionary GeForce Now cloud gaming service, we have you covered. Of course gaming is no longer a solitary endeavor, share your epic gaming conquests with your family and friends by broadcasting your gameplay directly to Twitch and even provide live play-by-play commentary. NVIDIA has partnered with Twitch to include this capability into every SHIELD Android TV. Yes! SHIELD lets you record videos, take screenshots, and even broadcast to Twitch. So sit back as we show you how to Stream and Broadcast your very own Twitch channel with the Twitch app on SHIELD Android TV. First things first, be sure to create a Twitch account. It’s free and easy. Just head over to twitch.tv and create your account. The “Record and Share” menu enables you to take screenshots, record videos locally and also broadcast to Twitch. You can access the “Record and Share” menu by pressing the Android TV “Home” button on your SHIELD controller for at least three seconds. 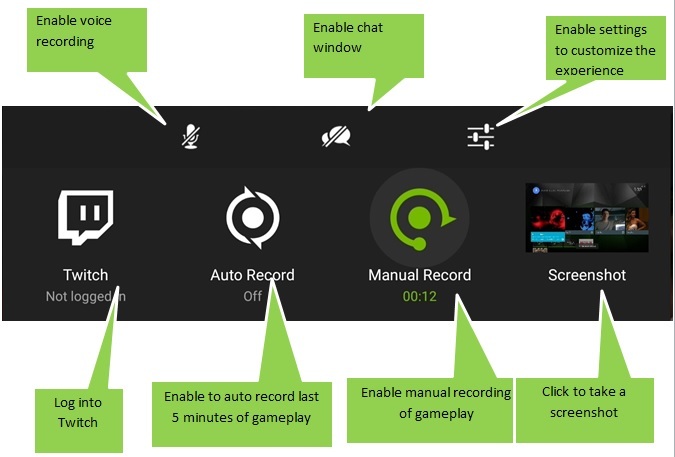 The “Record and Share” menu also provides options to enable chat windows, record video through an attached webcam, record your audio commentary through the built-in microphone on the controller or through an attached headset microphone, and a settings menu option to further customize your Record and Share experience. The “Record and Share” menu enables you to easily record what is being displayed on your screen. When you enable Auto Record or Manual Record, SHIELD immediately starts recording what is being displayed on screen. Note: “Record and Share” feature will not be able to record DRM-protected content such as movies streamed from Netflix, Google Play, and other services. To enable live broadcast to twitch.tv, a Twitch account is required. You can log in with an existing account or set up a new account from your PC or directly through SHIELD. Once you are setup with a Twitch account and logged into it from your SHIELD, simply bring up the “Record and Share” menu and select the “Twitch icon” to immediately start broadcasting the audio and video that is being outputted to your TV. You can add audio commentary to your broadcast by just speaking into the built-in microphone of your SHIELD Controller. You can even connect a headset to the SHIELD controller and add audio commentary through the microphone of the headset jack. To enable video commentary to your broadcast, you will need a webcam attached to your SHIELD Android TV. We recommend the Logitech HD WEBCAM C270 ($39.99). Simply plug it into an available USB port, fire up the Twitch dashboard and make sure that the video camera is enabled. Video, audio, and chat overlay can be enabled or disabled within the broadcast by selecting the appropriate menu choices within the “Record and Share” menus. There you have it! Now you’re all ready to jump into the fray and become a Twitch superstar. All thanks to SHIELD. So run out and buy a SHIELD Android TV today! What is Google Cast and Chromecast?